The long-awaited follow up to 2004's "Ascension Attempt". In 2005, while working on their follow-up sophomore album, the band played what would be their last show, and seemingly vanished into hiatus, with members focusing on other projects and bands. Flash forward to 2008 when Init Records approached the band members about a reunion show for the second annual Init Fest. The band played to a packed house and was well-received. The energy and excitement was in the air; THE BLINDING LIGHT had returned to the stage. In the midst of this all, the band finally brushed the dust off of their unfinished follow-up album, and proceeded to finish the album, marking their most monumental album to date, taking the bands sound to the next level; the final result, Junebug, has been highly anticipated by fans for years, often popping up as the subject on message boards and websites. Features breathtaking original artwork and layout by Aaron Horkey of Burlesque Design. Printed and packaged in a 100% recycled EcoPak digipak. 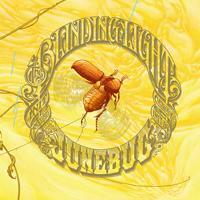 The Blinding Light � Junebug It�s been awhile since The Blinding Light have released something. Yet age has not rusted this thrashing machine. Rather this is some of best material the band has put out ever. The musicianship has increased dramatically since The Glass Bullet EP. Brian Lovro still sounds like Scott Kelly of Neurosis.